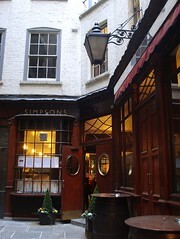 Hidden away down a pedestrian alleyway photo, this gem of a pub and restaurant dates from 1757. The building was originally two late-17th century houses that were turned into a chop-house and coffee shop, and the business has since mutated into its present form. On the ground floor is a small bar, primarily for vertical drinkers as there's only room for a very small amount of seating, and a small dining room. Seating in the dining room is on hard, narrow benches with solid straight backs, six people to a table photo, and there are maybe 40 covers crammed into a tiny space, so it's quite cosy and small groups may end up sharing a table. There's also a restaurant on the first floor and a wine bar in the basement. As of May 2014, food is served noon-2:45pm on Mondays; and 8am-10:30am and noon-2:45pm on Tuesdays-Fridays. It's closed completely on weekends. The menu PDF rotates through daily specials, and concentrates on traditional English food. DrHyde and parent visited for lunch on a Wednesday shortly before Christmas 2010. It was busy and we hadn't booked, but they managed to squeeze us in to the dining room. The real ales available were Bass and Harveys, and the Harveys was well-kept, if a little on the cool side of perfection. Service was very quick and friendly. DrHyde had the roast duck with seasonal vegetables, which, it being winter, were roasted parsnip, carrot and apple, bubble n' squeak (there was also an option of chips), and cauliflower cheese. Mum had the pork and leek pie. Both dishes were excellent. Particularly noteworthy were the pie crust, which eschewed the barbarous habit of puff pastry for something heavier and suety, and the cauliflower cheese which had a real cheesy tang to it instead of just being cream with a hint of a smidge of a passing mention of cheese. Kake, bob, and Ewan visited for breakfast in December 2016, as the first stop on our 2016 Waterloo And City Line Pub Crawl. There were several other breakfasters in when we arrived shortly after 9am, but no problem finding us a table. No music was playing. Service was welcoming and attentive, with frequent topping-up of tea, coffee, and toast (all of which are unlimited, though tea and coffee are a separate charge on top of breakfast). Kake's smoked salmon and scrambled eggs (£8.50) photo was pretty good. The eggs had a beautiful texture, though I'd have preferred just a touch less salt. The smoked salmon was fine, and just the right quantity to balance the eggs. Ewan's beans on toast (£5) photo was perhaps a little basic, but then again this isn't a place that particularly markets itself to non-meat-eaters. bob had the full English breakfast (£12.50) photo. The sausage was good quality and quite large, and the bacon was also good quality. The eggs were fine, but could have been runnier. I liked that they let me have both black and white pudding, instead of making me choose between them as the menu suggested, and I also liked that the toast came unbuttered, making it suitable for a lactose-intolerant person. I did feel it was perhaps a little small for the price, but the quality of the ingredients and the unlimited nature of the accompanying toast made up for it. The handpumps on this visit were clipped for Marston's EPA, Fuller's London Pride, Adnams Southwold Bitter, Bass, and Sharp's Doom Bar. We however went for the more breakfasty options of a bloody mary (£5) photo and Guinness (£2.80/half). No service charge was added to the bill photo. DrHyde's verdict: Not only is the food really good, it's well-priced too. Yes, it's a little more than you would pay for lunch at most pubs, but the quality is so much better that it's worth paying for. I strongly recommend this place. Kake's verdict: I like the unlimited tea and toast aspect of things very much, and I would come back if I wanted a leisurely breakfast in the City. It's a shame the seats are so uncomfortable, though; my leg went to sleep at one point. Accessibility: At least one step up to get into the ground-floor dining room and bar. The restaurant, wine bar, and toilets involve steep staircases. Wheelchair users will probably not be able to easily negotiate the ground floor passages as they are narrow and twisty, and in any case the interior is very cramped. Last visited by the 2016 Waterloo And City Line Pub Crawl, December 2016. Opening hours and food times obtained from a member of staff, May 2014. Last edited 2017-02-13 09:32:26 (version 12; diff). List all versions. Page last edited 2017-02-13 09:32:26 (version 12).